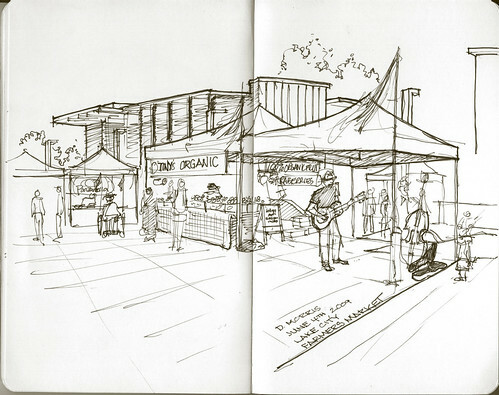 Urban Sketchers Seattle: Lake City Farmers Market -part 2! Lake City Farmers Market -part 2! It was a good day for sketching for sure. It was also a pleasure to meet both of you ( Gabi and Beth ). Thanks to both of you for sharing your sketches and techniques. I'm looking forward to spending more time sketching with both of you and meeting the rest of you. The sketch turned out ok. It is funny comparing the three sketches. Gabi's is a close up. Beth's is a little larger. Mine takes in even more. I like drawing roof lines and trees. Love how we all pull something different out of the scene! Wonderful sketching with you! wow, you really got the sense of place with this wide view, all the elements are very well fitted Dave! your love for the rooflines and trees pays off, very handsome! Also neat how you got the breeze going through the streamers on the booths!